SWM opened operations just two years but their history goes back to 1971. 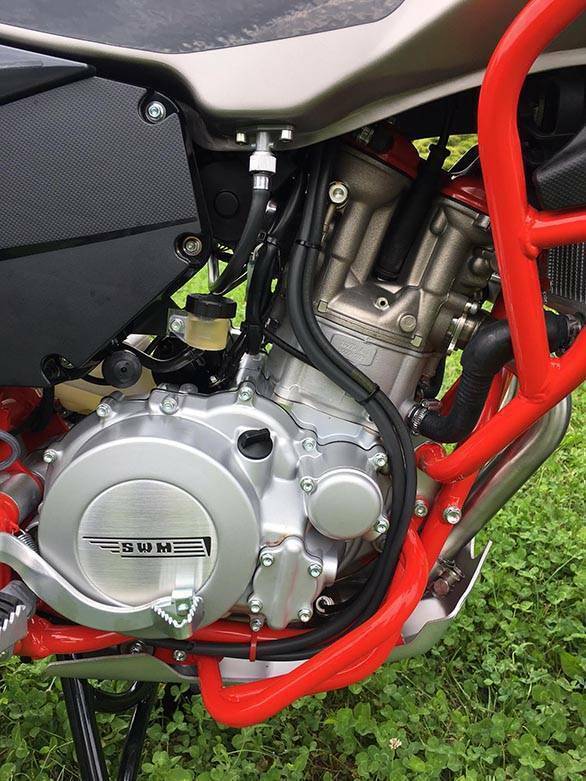 SWM's name, depending on who you believe means Speedy Working Motors or is a shortened abbreviation for SWM, which is the names of their founders. It is, thankfully, unequivocal; that they started making dirt bikes of various kinds in 1971 and the first SWM business went south in 1984. But they left behind, in Italy especially, a whole bunch of 40 years olds who remember the SWM brand fondly. And from that stable, today, comes the Superdual T which we got to ride at the (new) company's first ever "media day." The Superdual T has a lofty seat height at 890mm but don't panic just yet. The long suspension sags a bit when you climb on and most peoplewill be able to get at least the toes down. The factory we were visiting is in Biandronno on the outskirts of Varese, a little town that is also home MV Agusta. In fact, motorcycle history runs deep here. Cagiva, the old and current dormant Italian brand made itself a home here and at one point, it called Ducati, Husqvarna and MV Agusta its own. And the SWM factory, in fact, is the Husqvarna factory. The factory was where Huskies were made under BMW Motorrad ownership and product development as well as regular production was underway here. Then BMW decided that it wanted to focus on its own-brand motorcycles and Husqvarna was sold to KTM. The men in orange decided that they didn't want any part of the factory and took nothing but the brand, more or less, to their Mattighofen, Austria headquarters, leaving a 80,000 units a year capable factory, product lines, R&D activity and all behind. During this time, the SWM brand had disappeared. But backed by Chinese money, SWM rose out of its sleep by acquiring the factory as well as the product lines. In there is the frame and motor that underpin the Superdual. History lesson over. So what we have here is a steel frame that hosts a 600cc single cylinder engine. 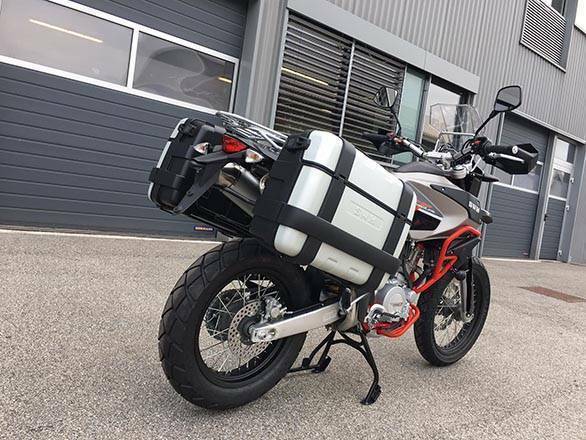 You will see references to a SWM 650, and it confused me too, but seems that the 600cc 'platform' is referred to as the SWM 650, it a naming quirk, if you will. Anyway, so SWM, which started operations just three years ago took the old engine and updated it. In came fuel injection and other details, all aimed to ensure that the engine could meet current emissions norms. The motorcycle in the photographs is the new Euro IV model that is just entering production, in fact. In this guise, this liquid cooled and fuel-injected oversquare 600cc single makes 54PS at 7,500rpm as well as 53.5Nm at 6,500rpm. Those are reasonable power figures from a big single, but it isn't the cutting edge - the KTM 690s boast a 50cc larger engine that makes over 70PS and are considered the most powerful singles in production at the moment. But as you will see, not everything is about the latest technology. The wet sump engine is completed by a slick-shifting 6-speed gearbox and chain final drive. 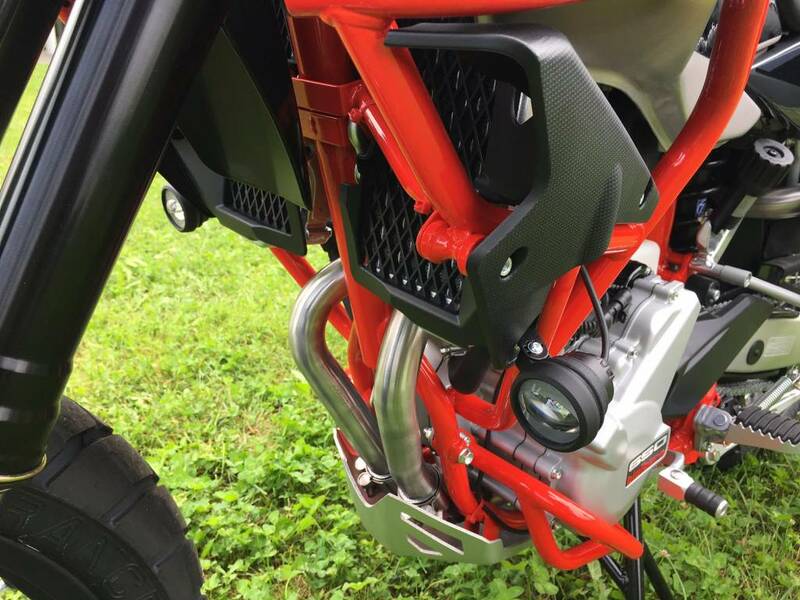 The engine is mounted in a steel single-downtube double cradle frame and it's a proper dirt bike frame. The minimum ground clearance is over 200mm and the seat height is a lofty 890mm. This sounds silly-tall, but remember it also has a narrow and near-flat dirt bike seat so more people will reach the ground than you think. The other reason why the bike won't feel that tall is the suspension. 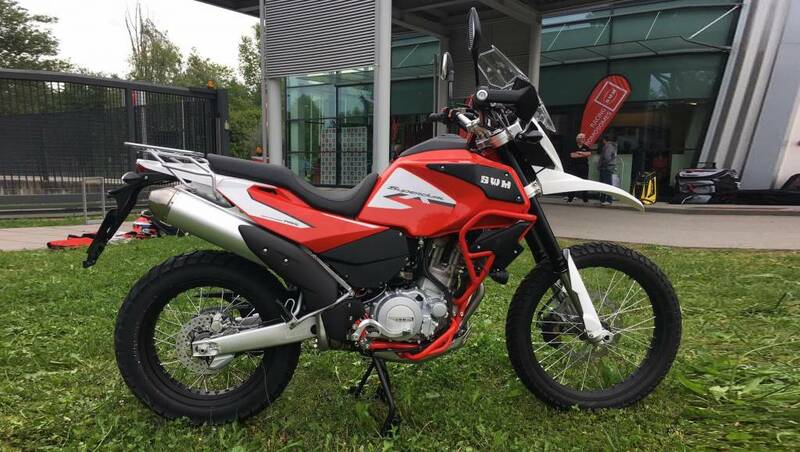 The SWM has adjustable suspension front and rear with 210 and 270mm of travel. When you sit, the ride height lowers completely as the suspenders take your weight. It is still, all things considered, a tall motorcycle. Rounding out the equipment is a 300mm single disc and 22mm disc at the rear, ABS is standard. In all of these ways, the Superdual T sounds like a full-on dirt bike, yes? Well, it isn't far from the truth because that is the origin of the machine. But SWM intended for the Superdual T to be a on-off roader. And to that end, they've given it 19-inch and 17-inch rims and the Metzeler Tourance tyres are on-off road tyres with a road bias. And riding it underlined both the off-road history as well as the road-going nature of the machine. The age of the engine peeks out now and then, for example, the engine can be hard to start despite the electric starter and the fuel injection. But it is a good one. Torque arrives easy and quick and bombing along at a reasonably quick pace up the mountain roads in the vicinity of the factory, there never seemed to be a need to rev the engine up, even on the steep inclines. I saw nearly 150kmph at one point and the motorcycle was still pulling happily along. Stripped off the luggage, the SWM Superdual T looks (and feels) like a big dirtbike. The panels looks good and the quality levels are par for the course. The thing to watch will be vibration - more to do with our expectations of smoothness than actual shaking, though. Big singles cannot fully hide their rocking motions and the SWM lets a little bit slip. I think I can make my peace with the level of vibration I felt with ease but I know Indian customers can be demanding. On the flip side, I loved how the chassis felt. Hitting potholes and manholes covers is almost a game because the SWM's suspension is on the ball. The general chassis attitude is very stable and that leads you to think that it's stiff. But it allows the wheels to move quite easily so that the hits are isolated and absorbed easily. I really liked the poise of the setup and the sense that you almost would not ever be able to cause any rim damage with this level of suspension. What will take getting used to, though, is the diminished sense of feedback that comes from tall suspension and a 19-inch front wheel. The tyres are grippy and extremely trustworthy and in the short time I rode the Superdual, I had no problem committing to lines, and then changing them as I charged up an unknown road. When I clambered off the bikes having clipped my ankles on the Givi panniers, I was smiling. Because the one person in the country who has the KTM 690 SM right now knows how good and apt a 50-70PS big-engined dirtbike-based motorcycle can feel in our conditions. The Superdual ticked many boxes for me on this short ride and left me waiting to ride it a lot more. And that should be easy to arrange. Motoroyale, who represent MV Agusta in India will also exclusively sell the SWM in India. For the moment, the Superdual is the only motorcycle they are working on getting. The plan is to send the Euro IV version into homologation shortly. Motoroyale will modify their SKD line they use for the MV Agustas to accommodate full CKD assembly of the Superdual T. The company believes this should allow them to price the motorcycle at below the ?5.5 lakh mark, ex-showroom. 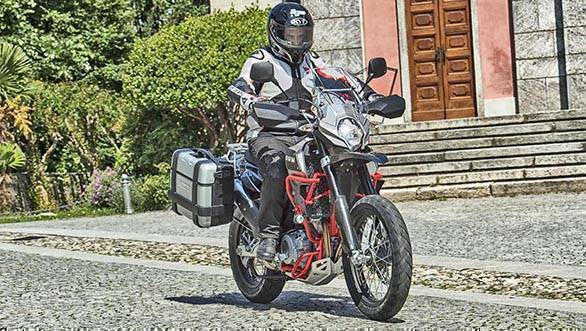 Motoroyale always intended to be a multi-brand operation and the SWM motorcycles will be sold alongside the MV Agustas although obviously, the customers for both brands will probably have very little overlap. The overall quality of the motorcycle seemed reasonably good to me and the parts and finish levels are decent. I am not going any deeper into a quality assessment because the Euro IV machines were likely first generation production. 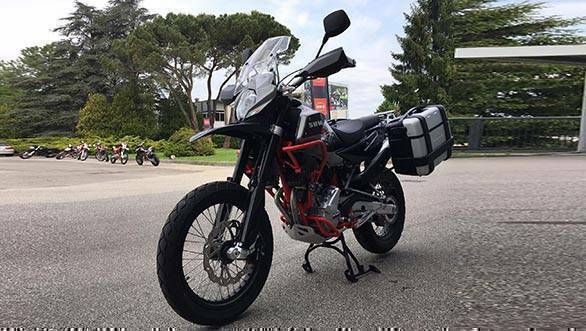 But considering that, the price seems in the ballpark for a 55PS, 600cc off-road capable tour-enduro style motorcycle. But is it the dream? It certainly is making the right sounds and I cannot wait for October to come around and for us to find out! 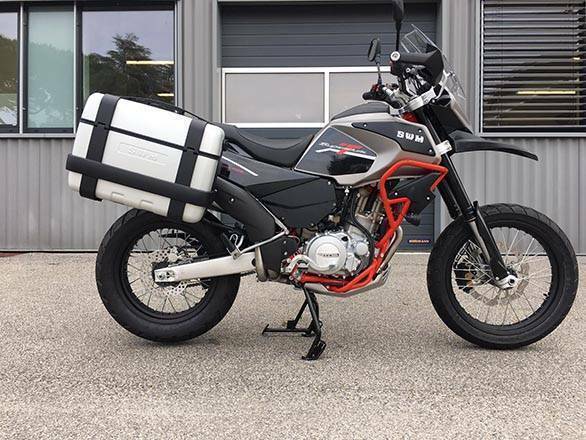 The SWM SuperDual X is based on the T but gains a 21-inch front wheel, 18-inch rear wheel and lower gearing for a more off-road biased touring platform. We did not get to ride it, but the SuperDual X is the more off-road capable edition of the SuperDual T. So while the engine and frame remain largely unchanged, there are three significant changes. First, the wheel sizes are now 21" front and 18" rear rims which changes the bias towards off-roading. The tyres also change from the Tourance to the Tourance Sahara where a wider spacing between the tread blocks suggest a bigger ability to hook up and drive on loose surfaces. 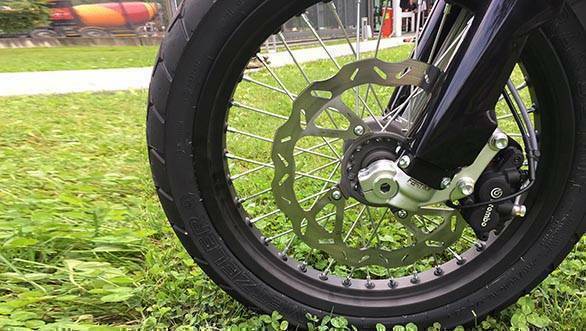 Finally, a bigger rear sprocket (plus the wheel size) also lower the overall gearing which should make off-roading easier at the expensive of top speed. 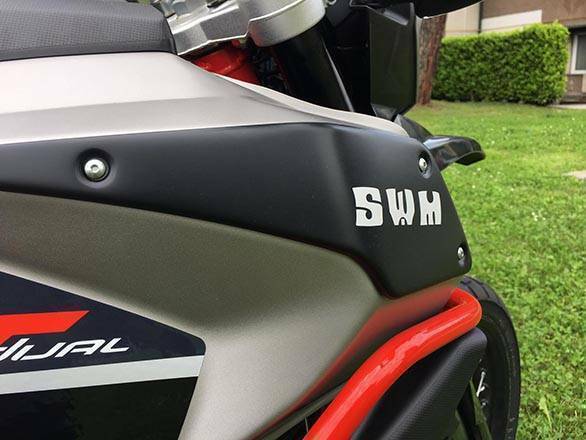 SWM is expected to put the SuperDual X into production in Italy this October and Motoroyale says it intends to have it go on sale in India as soon after that as possible.